Arrive At Bhubaneswar Airport/ Railway station and transfer to Puri. On the way visit Konark famous Sun Temple dedicated to lord Surya. On arrival at Puri. Check in hotel and relax for some time. Later visit Jagannath Temple. 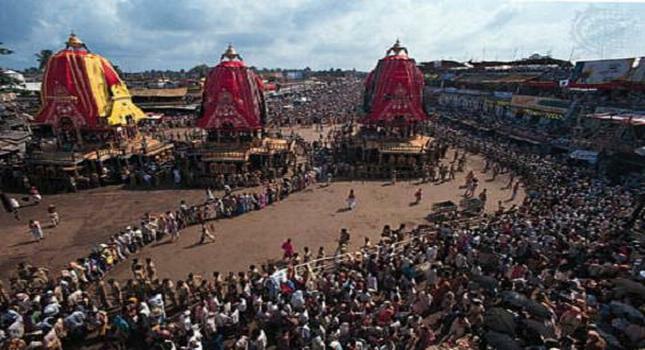 This Temple is known for its annual Rathyatra and series of festivals then visit Grand Road and Golden Beach. One of the largest beach of the world. In evening back to the hotel. Overnight stay at the hotel. After Breakfast proceed to full day sightseeig of Alarnath Temple and Satapada Lake .This Lake is famous for Dolphins and migrating birds. In evening back to the hotel. overnight stay at the hotel. After Breakfast check out the hotel and transfer to Bhubaneswar. On the way visit Pipli Village one of the most important cottage industries. On arrival at Bhubaneswar check in the hotel and relax for some time. Later visit Dhauli Giri the famous Japanese temple and the rock edict of Ashoka. In evening visit Lingaraj temple, Rajarani, Mukteswar temple and Rammandir. After Sightseeing back to the hotel. Overnight stay at the hotel. After Breakfast check out the hotel and proceed to Khandagiri Cave, Udayagiri Jain Temple and Iskcon temple then drice to Bhubaneswar Airport/ Railway station to board a flight or train for your onwards journey. If you have not decided yet or wants to customize tour itinerary or hotels listed above in "Puri Sojourn Tour Package From Via", then we can change the travel itinerary and make a personalized, tailor-made holiday package, especially for you. We can modify this travel package as per your itinerary, budget, duration and the tourist places you would like to visit, including transportation and airfare should be included or not. Please fill the form below to contact us.